Dala Squid And Friends [H6628] - $10.00 : Yarn Tree, Your wholesale source for cross stitch supplies. The Dala Horse has long been the unofficial mascot of Sweden; the cheery red folk carving is recognized around the globe as a Scandinavian icon. A series of similarly saddled critters join in the celebrations. 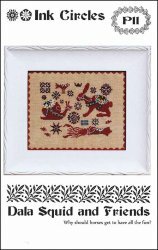 Stitch the sampler or use the individual animals for ornaments or other smalls. Stitch count 107w x 80h.